Just this week, gamers around the world were stunned to hear that a public vote online had determined that the Monopoly Iron must go and that after nearly eighty years, it would be replaced by a cat. Since I’ve always harbored the desire to be a journalist, I thought I would try and get in touch with the iconic Mr. Iron for an interview, which he graciously agreed to grant. “I must admit, I was pretty steamed by the whole thing,” he answered. “I mean, you spend your whole life doing your job, day in and day out and then suddenly, when you least expect it, they just pull the plug on you”. “Not a clue” said the Iron. “I keep going back and forth and back and forth and back and forth in my mind, trying to remember any sign that I might have overlooked but I can’t recall any hint that this was coming. I just came in, was told to report upstairs and when I got there, the ironing board was waiting for me”. “Did they give you any reason for the public’s opinion or their decision?” I asked. He paused in thought for a moment, then said “Only something about how sorry they were, that times were changing and that I just wasn’t pulling in the numbers anymore. They said my popularity was down and that it was time they brought in a ringer”. “A bell?” I asked. “A cat” he answered, with a hint of sadness. The Iron’s story isn’t the first time that Monopoly has unceremoniously retired one of its players. Over the years, the Canon and the Man on Horseback have all fallen to the whims of passing fancy and after 78 years with the company, the Iron has seen them come and go. “I remember one time there was this bag of money” he reflected “and we all thought he was really a keeper but then one day they just yanked the purse strings and he was gone. You think you’re doing something significant, something lasting but then you find out life has been pulling the worsted wool over your eyes”. It was when I mentioned his retirement package that he really got up a full head of steam. 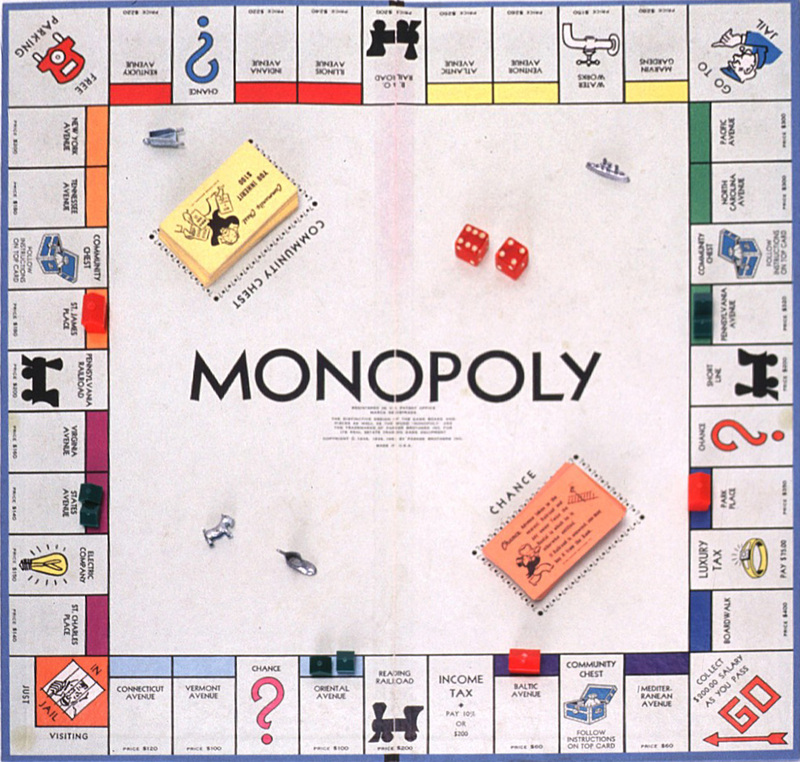 In addition to $5000 in Monopoly money, he was given a “Get Out of Jail Free” card and the deed to Mediterranean Avenue. “That was really the biggest slap in the face,” he hissed. “Mediterranean Avenue? It’s the cheapest piece of property in town! No one wants that place,” he said, referring to the somewhat distressed property just ten blocks and one corner over from where we sat. “It’s in the worst part of town, right up the street from the jail in the low rent district. Most people just hurry right through there, hop on the Reading Railroad and get out of dodge”. I asked him whether or not he would try to file an appeal or even take his case to the courts of public opinion. “I tried calling the Chairman of the Board” he stated, still fuming “but my calls have not been returned. As for public opinion, I don’t think I’m ready right now. It’s always better to be cool when dealing with the Permanent Press and I’m just not there yet”. I thought this was a good time for a break and we paused for a moment so he could refill his water reservoir and cool down for a bit. He seemed to become more relaxed and talked about his friends, his life and his work over nearly eight decades. When I asked him about how his friends took the news he responded “Oh I think they were pretty sad but they really couldn’t put up more than a token resistance to the decision. They all came by and told me how much they would miss me though…. the Hat, the Shoe, the Racecar, the Battleship, that thing that no one could ever figure out what it was [the Wheelbarrow], all of them. They were a great bunch of characters and we spent many a turn on the same spot over the years”. On talking about his life, he said “I came along right in the middle of the Great Depression so I’ve been around and around the block a few times. I always tried to stay on the move though, never at the same address for very long. Some might think that kind of rootless existence isn’t stable but I really got to see the world and just when I thought my luck had run out, someone would slip me $200 bucks and that was enough to keep me in the game”. “Do you have any plans for the future?” I asked him and he nodded, saying “I’ve put some feelers out. I have applications in at the Water Works and the Electric Company. Even at my age, I’m still great at smoothing out problems, even the occasional wrinkle that occurs. Those are skill sets my coworkers at Monopoly are going to miss when I’m gone,” he concluded. It was time to wrap up the interview so I asked the Iron if he had any parting words or thoughts he would like to share. “Life is always a game of chance” he said as if in deep thought. “You never know what throw of the dice will land you where but you have to make the best of it and even when it seems you’ve reached the end of the line, keep pressing on. Seize each opportunity and when one comes along, always strike while the iron is hot”. 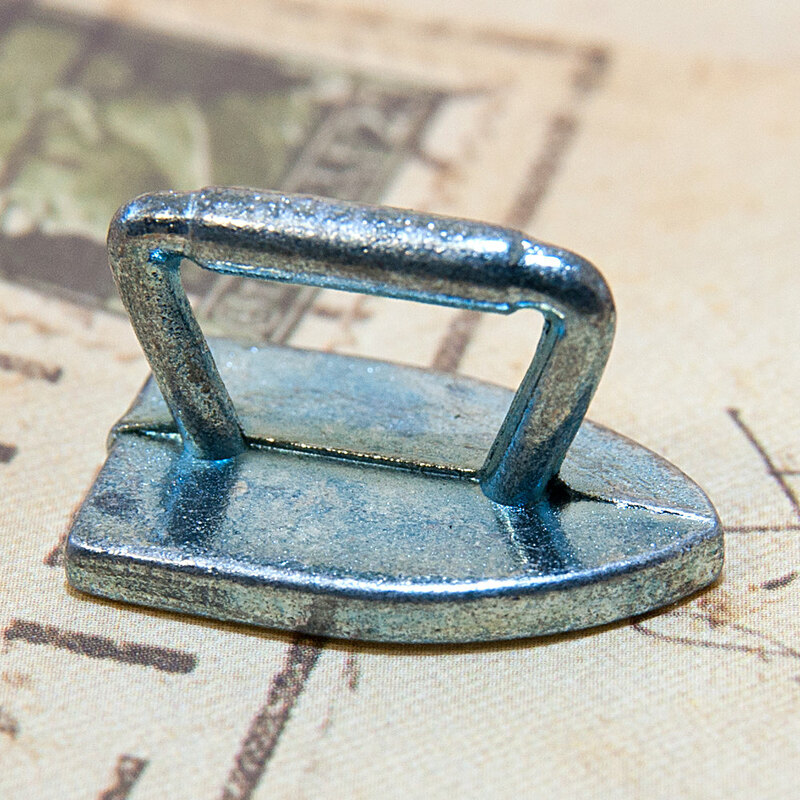 Thank you, Mr. Iron, for helping us keep a handle on things. Funny! I too will miss the iron – seems wrong, doesn’t it? This was funny – but I too sill miss the iron. Seems so wrong, doesn’t it? Yes I agree. It is like losing a piece of history and though I really like cats, surely there was room for both!